Due to the sale of The Firehouse Gallery, classes are on hold. We hope another art teacher will take over, and when/if they do, this webpage will be updated. If you have an interest, or know someone who might, please let us know, or click this link: REALTOR.COM or contact our realtor, Sandra Sheets at 609-731-8794. Our Summer Art Camp Program is AwEsOmE! ...And did you know the director and lead instructor, Eric Gibbons, won NJ's Best Art Teacher Award2015?! Other programs can't say that (And they cost more too.) You can read about it HERE. ​Debra Rogers: "When you have tried the BEST there is no other place to go! 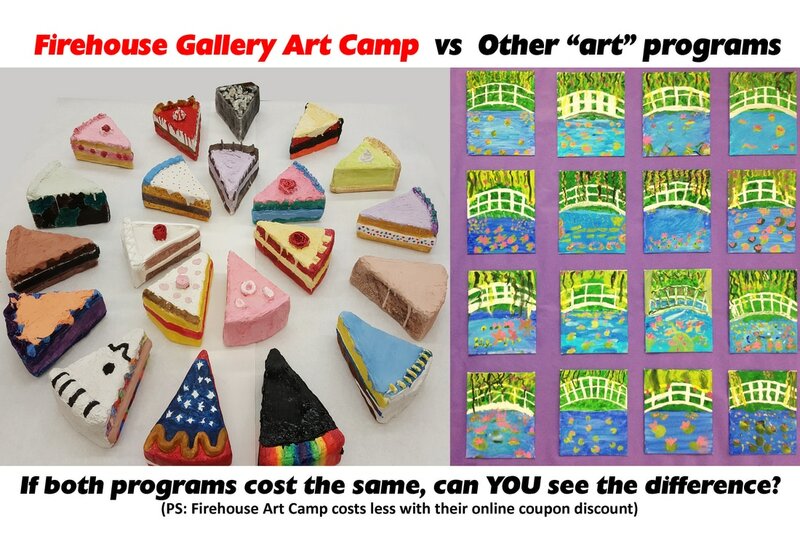 My son joined the firehouse gallery art camp when he was 7. Continued almost into high school. Not an ARTS AND CRAFTS CAMP. Eric's art camp is a place to learn and experience real artistic skills while exploring individuality. We have been so fortunate to have this gem in our very own Bordentown!" Sharon Doroba: "My daughter was a student of the Firehouse Gallery in the 90's she loved it now that my son loves to go. Eric and staff keeps the kids very busy. Great Program." Kelly Meyer: "Best art camps and teachers around. You won't be disappointed! My girls loved the summer camps. They've learned so much and one is hoping for a career in art because of all she learned." ​and we will confirm payment by email within 24 hours. Enter your payment amount & keep quantity at "1"
REMEMBER: We must have a signed application with your payment. Without it, we do not know what classes you have paid for. Please forward it ASAP. ALL FULL, Camp Ends on July 27, 2018. We have been running our summer art day camp since 1994. Many of our lessons, known for their fine arts approach and innovation, and have been published in art education books used across the country and in English speaking portions of Europe. You can find some of the titles HERE. Our program is TINY with just 2 rooms, and about 8 to 10 students in each. We employ ONLY certified art teachers who pass an FBI background check, plus an experienced aide who helps out with our youngest campers. This means we have a ratio of 6 students to one adult. Unique in many ways and allowing us to explore art that other camps won't even attempt. Many of our lessons and our teaching philosophy can be found on our art education blog HERE. Each week is a different theme, here are 4 weeks from camp in 2017: Week 1, Week 2, Week 3, Week 4. Class lists and schedules are usually finalized and available by mid-January for the following summer. Our program is for children ages 7* through 16. Classes run weekly in July. Families may pick and choose the weeks they wish to participate; each week is a different theme. Some themes may include: cartooning, treasure maps, sculpture, drawing, painting, pastels, and much more. The day camp program runs for either half or full-day schedules depending on what fits best into your schedule and budget. Morning sessions are from 9 a.m. to noon. Afternoon sessions are from 1 p.m. to 4 p.m. Those staying a full day may stay for a one-hour supervised lunch. Extensions are also available before and/or after camp for a small fee. All classes run from Monday through Saturday. Scholarship information HERE for families of talented students in financial crisis. *Students MUST be at least 7 years old at the time of attendance for regular full and half day sessions unless otherwise noted in the application.